Today, I made my way to Dinslaken in Germany where we kicked off the C-MapExp campaign. Here I met up with participating groups from the Universities of Bremen and Berlin, and scientists from Metair Switzerland. 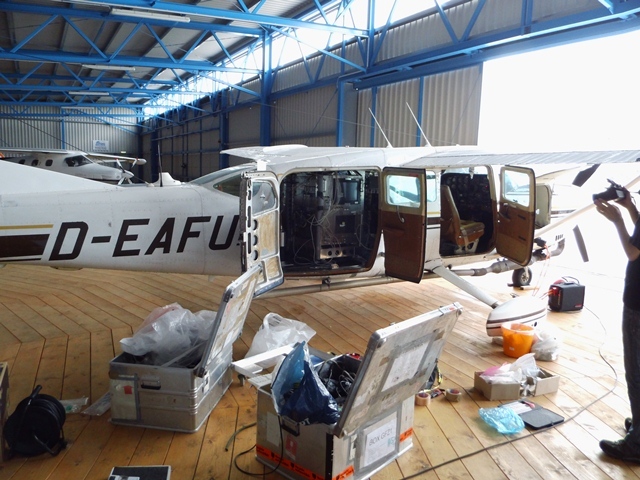 Fitting the MAMAP instrument into the Cessna. It’s the size of a washing machine and weighs 120 kg. The campaign will hopefully provide valuable information on the capabilities of a new Earth observation satellite mission concept called CarbonSat and help ESA and collaborating scientists in the design of the mission. The main objective of CarbonSat is to measure carbon dioxide and methane sources and sinks to understand the processes that control the carbon cycle and provide independent estimates of greenhouse gas emissions (fossil fuel, geological CO2 and CH4, etc.). We are now here in the Rhein-Ruhr region of Germany to perform these measurements with airborne systems in an area with strong localised emissions of CO2 and CH4. We are going to do this by taking measurements using the airborne MAMAP system, which is configured in such a way that it is similar to the Carbonsat concept. With MAMAP it is possible to measure the sunlight above the aircraft and the sunlight reflected from the ground below the aircraft. Since every gas has a unique fingerprint, we can detect CO2 and CH4 concentrations and measure the differences between the readings. However, to take these measurements we are dependent on a clear blue sky. The entire group hasn’t been too optimistic since we’ve had pretty bad weather this summer. Apparently things are on our side now and we expect good conditions over the coming days. To evaluate the measurements from MAMAP we are making use of a second aircraft. The simple idea is to fly with MAMAP at greater heights and measure from above and use the small aircraft to fly below and measure the concentrations directly to be able to compare the two measurements.